Dell's tablet plans for 2012 have slipped out, revealing a chunky Windows 8 slate and a tablet-laptop hybrid also set to run with Microsoft's tile-centric OS. 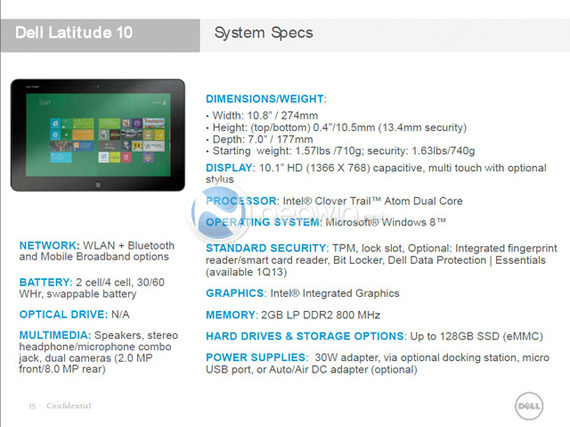 A leaked company product slide shows the upcoming Dell Latitude 10 to be a dual-core tablet with a 10.1in, 1366 x 768 pixel display, Neowin reports. The Windows 8 fondleslab packs 2GB of Ram - 800MHz DDR 2, apparently - and up to 128GB of SSD storage all put to use by a two-core 'Cedar Trail' Intel Atom chip. It also boasts a berth of security features, including a fingerprint reader, and offers something most other fondleslabs lack: a removable battery. Users can then pick which juice pack they'd like, with the choice of a two-cell battery estimated to last 6-8 hours, or a four-cell power pack which should run for 10-12 hours. It does look a little on the bulky side, measuring more than a centimetre in thickness, but with all that, as well as 8Mp rear-facing and 2Mp front-facing cameras, the Latitude 10 could give consumers something to think about when it hits shelves, most likely in November 2012. Back at the January Consumer Electronics Show (CES), Dell confirmed its Windows 8 tablet aspirations. 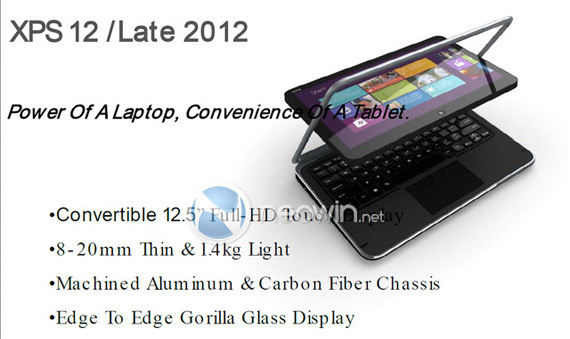 While this fatty fondleslab could be the first, a second slide shows a tablet-laptop crossover model, similar to the Dell Inspiron Duo. The Dell XPS 12 features a 12.5in display in a 8-20mm thick body that weighs just 1.4kg.